To my time of meat tusk Cottbus, exactly the discussion about the security of network knots arose. Manufacturers of 19"-Arrays like Rittal, Knuerr and Schroff in order to name only some on the market at this time with new products, that dealt with this topic. For the wardrobe supervision of the Fa. 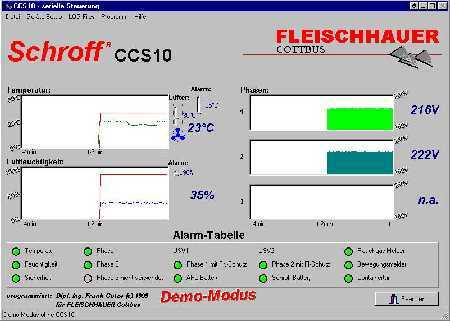 Schroff, I wrote a DLL together with a small visualising at that time in order to sensitize our customers better for the topic. Since the demo version was long freely for internet appearance a time over Schroff available, here the Tool for interested to the download. However, the program has a problem if big fonts are used. 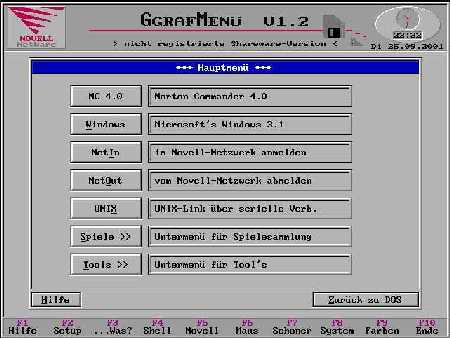 At a time, as DOS(after CP/M) still the true operating system was and Windows about faster PC's, therefore bigger 286er, had to beg, a small menu program originated as example of a simple one and, opposite the then BGI-Driver, leaps graphic surface for programs. The way: direct utilization of the VGA card under needed of the register compatibility to the IBM definition VGA. However soon, a problem showed this to also Windows of child had. It either didn't give graphics card manufacturers it always-again to all so backed one or mistakes immediately installed. To the memory: that was S3, OAK and many other, the time of Tseng, Trident - where already some particular one was 512kB on the card and VESA GOLD worth. But back... So, also GGRAF had to learn the then exotic persons to tame. But it was learned also useful immediately as well - it, to determine exactly character of the graphics card, to determine the CPU (up to Pentium) (for Cyrix-specials for example) and Novell-Netware, to pass on news. Come out, too late, a small library of graphic tools with mouse support and network support was. For DOS lovers, however, the tattoo at the forearm is meanwhile surely from, a small Tool was overlooked to the memory of old times here consequently.